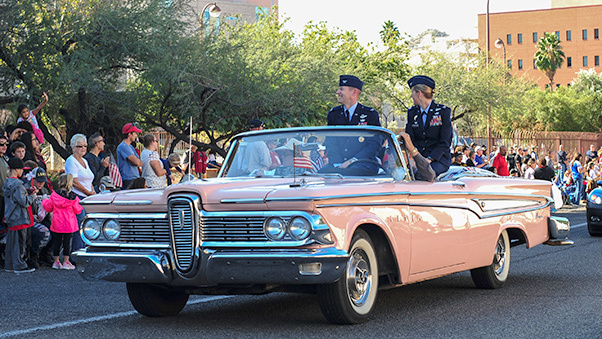 Col. Scott Campbell, 355th Fighter Wing commander, and his wife Col. Kim Campbell, 612th Theater Operations Group commander, arrive at the Tucson Veterans Day Parade in Tucson, Ariz., Nov. 11, 2016. 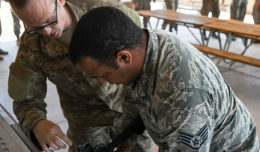 Scott Campbell is responsible for one of the largest installations and flying operations in the Air Force with more than 100 aircraft, 7,500 Airmen and 3,200 civilians at Davis-Monthan Air Force Base. 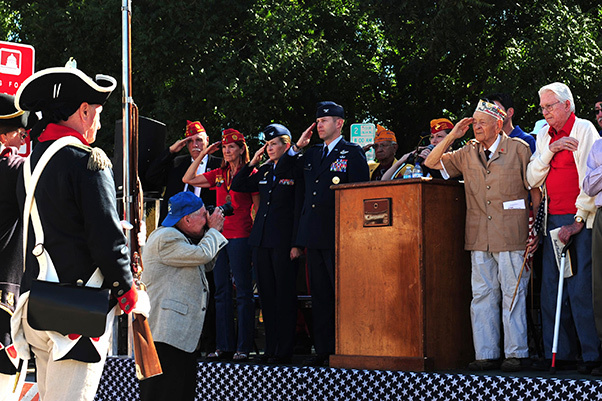 Col. Scott Campbell, 355th Fighter Wing commander, and his wife Col. Kim Campbell, 612th Theater Operations Group commander, join dignitaries as they render a salute for the National Anthem during the Tucson Veterans Day Parade in Tucson, Ariz., Nov. 11, 2016. 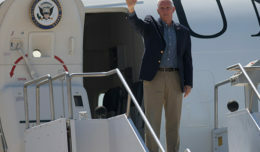 The parade is an annual event that honors U.S. service members past and present. 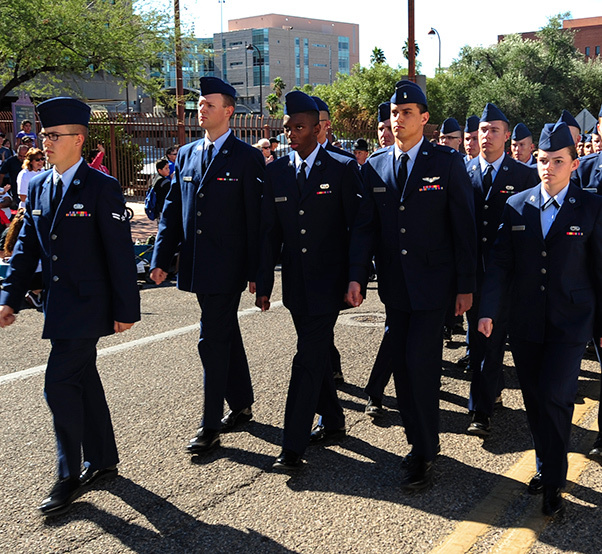 Airmen from the Davis-Monthan Air Force Base Honor Guard lead a formation during the Tucson Veterans Day Parade in Tucson, Ariz., Nov. 11, 2016. The Base Honor Guard represents the U.S. Air Force in ceremonies and celebrations throughout the year. 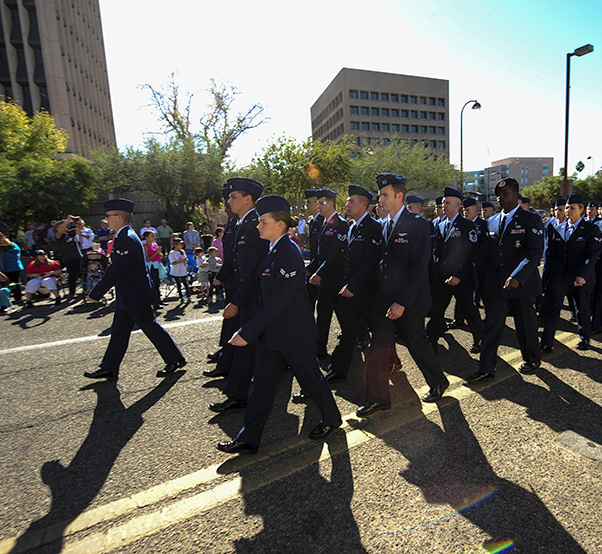 Airmen from Davis-Monthan Air Force Base march in a formation during the Tucson Veterans Day Parade in Tucson, Ariz., Nov. 11, 2016. 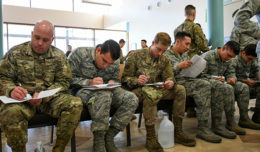 More than 100 Airmen participated in the parade, marching approximately two miles in one hour’s time. 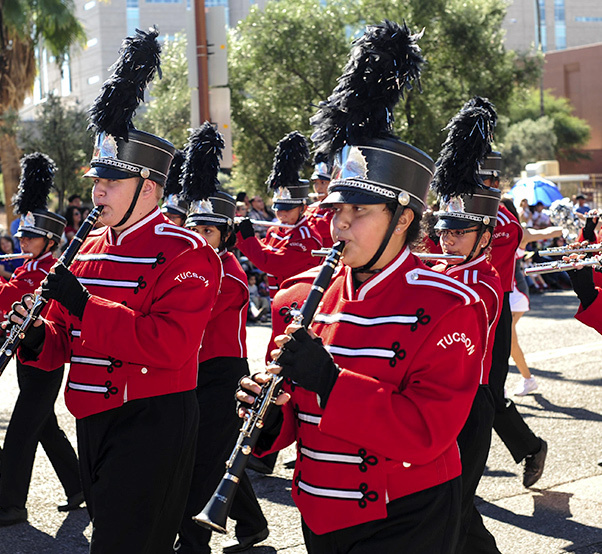 The Tucson High School Band marches in the Tucson Veterans Day Parade in Tucson, Ariz., Nov. 11, 2016. 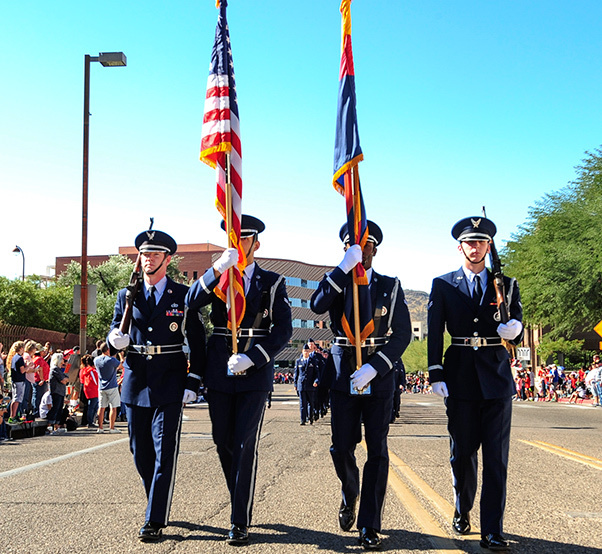 The parade is an annual event that honors U.S. service members past and present. 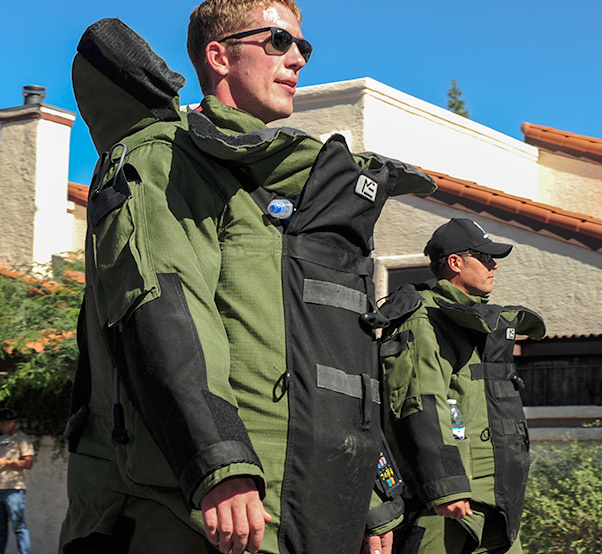 Explosive ordnance disposal technicians march in bomb suits during the Tucson Veterans Day Parade in Tucson, Ariz., Nov. 11, 2016. The parade is an annual event that honors U.S. service members past and present. 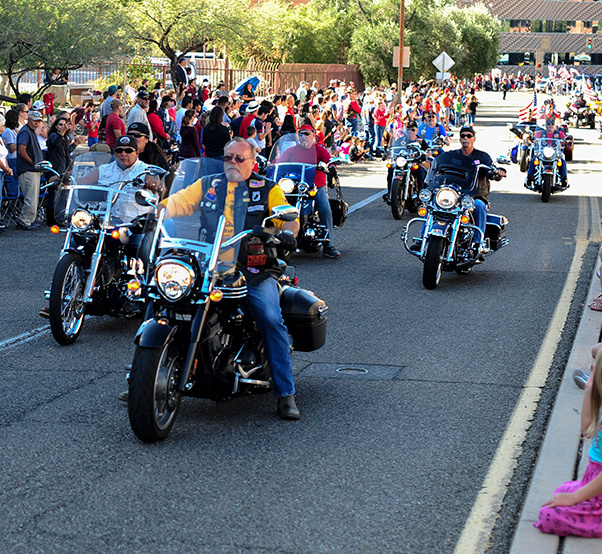 Motorcyclists ride in the Tucson Veterans Day Parade in Tucson, Ariz., Nov. 11, 2016. The parade is an annual event that honors U.S. service members past and present.